If you’ve seen one landscape photograph or painting, you’ve seen them all. Until you’ve seen one done by Los Angeles-based artist Don Suggs. 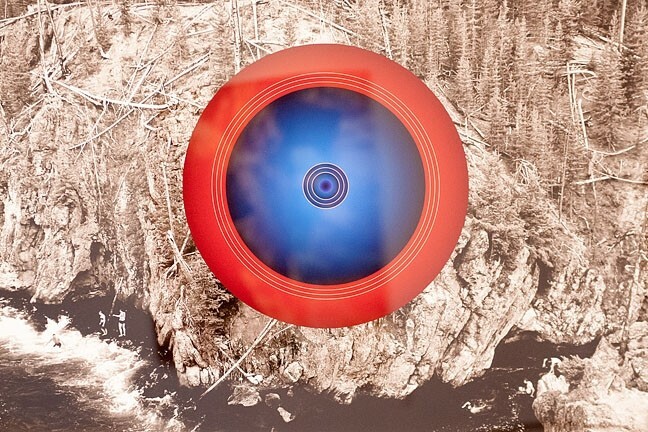 MORE THAN A PRETTY PICTURE: Artist Don Suggs hopes to disrupt the landscape by placing circles in pieces like Firehole. The blue and red in the circle corresponds to the different hot and cold temperatures found within the same pool of water. An example of a classic Suggs’ piece is a black and white photograph of a gorgeous, gushing natural hot spring, with a large, multi-colored circle placed smack-dab in the middle. It’s glaring. It’s certainly not the peaceful portrayal of nature that will lull you into a state of tranquility, but that’s the idea. Suggs, who works with painting, drawing, and photography, never planned on being an artist. But as a film student at UCLA long ago, he decided to take a drawing class for fun, with the now deceased artist Charles Garabedian. The rest is history. Nature is a constant theme in Suggs’ work, whether it’s obvious or not. 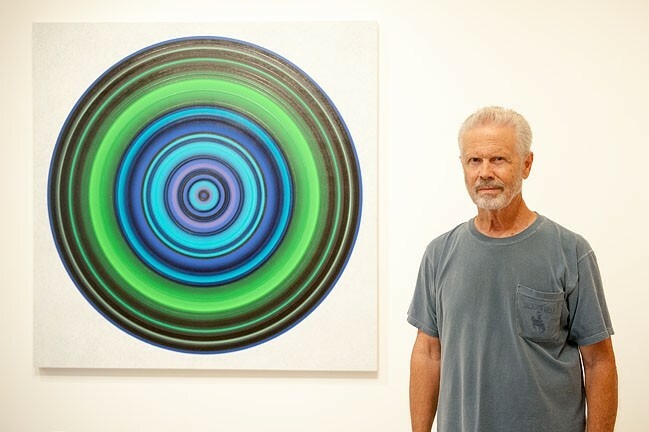 HYPNOTIC: Don Suggs’ captivating circle pieces, like Abyss Pool, pull their colors from hues found in the landscape. A series of abstract paintings in bold reds, blues, greens, and earthy browns features a series of winding, curving lines at first glance, but they’re actually cropped parts of images, inspired from photographs of Arizona landscapes. Similarly with Suggs’ photographic work, nothing is as it seems, at first. What looks like one photograph of a group of people enjoying the iconic landmarks like Yosemite, Yellowstone, or the Sierra Nevada is actually several photographs taken over a few hours. INTO THE ABSTRACT : Don Suggs’ exhibit, Arguing the Landscape, is on display at Cuesta College’s Harold J. Miossi Gallery through Sept. 16. The gallery is open Monday through Friday from noon to 4 p.m., and the first and third Friday of the month from noon to 4 p.m. Admission is free. Visit cuesta.edu for more information. While Suggs is aware that his circles have a certain hypnotic quality—you just can’t look away—a friend of his decided that you can in fact hear the circles as well. Ryah Cooley is headed off to the woods at rcooley@newtimesslo.com.